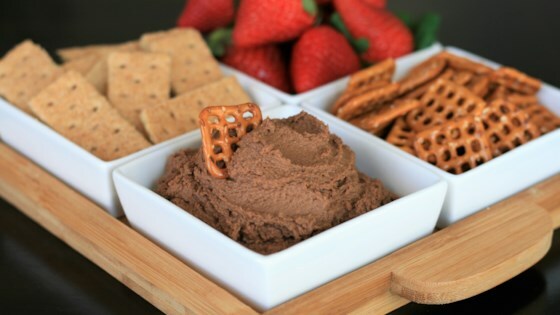 "Dessert hummus is a thing, and it is absolutely decadent without all the guilt! Serve with pretzels, strawberries, or graham crackers. Also makes a delicious filling for crepes topped with bananas. You can trick anyone into eating chickpeas when they taste this good! For a deeper color and flavor, use Dutch process cocoa powder." Combine chickpeas, cocoa powder, maple syrup, water, tahini, vanilla extract, and salt in the bowl of a mini food processor. Blend until smooth, scraping down the sides of the bowl. Add additional water, 1 tablespoon at a time, until hummus is smooth. YUM! I didn’t have tahini so decided to use cashew butter instead. It came out creamy and delicious. Thank you for the fun and inspiring recipe.